Pizza and focaccia are one of my all-time favourite foods. My love for pizza began young, of course. I have memories of sitting in my Nonni’s veranda, patiently watching and awaiting, as freshly proved pizza dough was taken out into the back shed. Within minutes it returned steaming, the fresh pizza smell filling the room. The big concrete woodfire oven would be going for hours, and I would sit happily eating slice after slice of pizza straight from the oven. While we don’t have the pleasure a woodfire oven at home, our household has definitely upheld the pizza making tradition. Mum has always been a whizz at making homemade pizza with our regular oven, and has taught me all the tricks I know. It’s not something we make all that often because it does take a bit of time, but when its pizza making time, it is pizza making time!!! There’s really nothing about this amazing creation that I don’t love. How the simplest, fresh ingredients come together to make the perfect pizza. The careful consideration (and debates) that goes into getting the flavour combinations just right. The way it brings people together as you all stand around the kitchen bench topping the pizzas. And it goes without saying, not much tastes better than a piece of pizza straight out of the oven with a crisp crust, soft chewy base and melt in your mouth toppings. Yummmmm. So you may be wondering how a girl with fructose malabsorption feeds that ever present pizza craving? 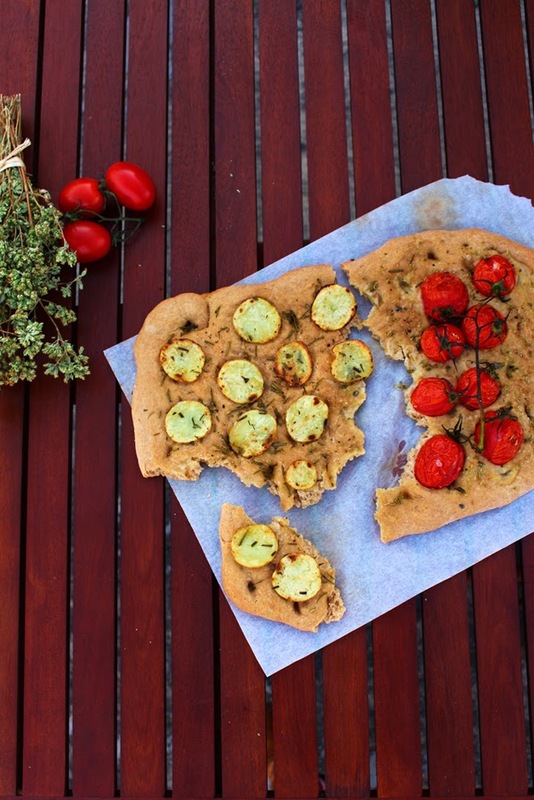 Sure, I can’t enjoy the same wheat-based pizza as most, which can be ever-so inconvenient at times, but like all things tasty, I find solutions! This spelt base is one of those tasty tasty solutions. Fructose malabsorper or otherwise, it’s a great homemade dough for anyone, and especially if you have trouble digesting gluten. The dough uses spelt flour (like this and this recipe) instead of regular flour. Spelt is very low in gluten, making it FODMAP and fructose friendly (but not suitable for coeliacs). When making pizza I simply omit onion and garlic from the tomato sauce (don’t worry I found it was rarely used in Italy anyway so it’s allowed ;), and I choose my cheese according to its lactose content and how much I think I’m going to eat. BUT in this post I’ve ditched the sauce and cheese completely! Sharing this recipe has been a long time in the works so a few weekend’s ago I took advantage of a quiet weekend down by the beach to get baking. 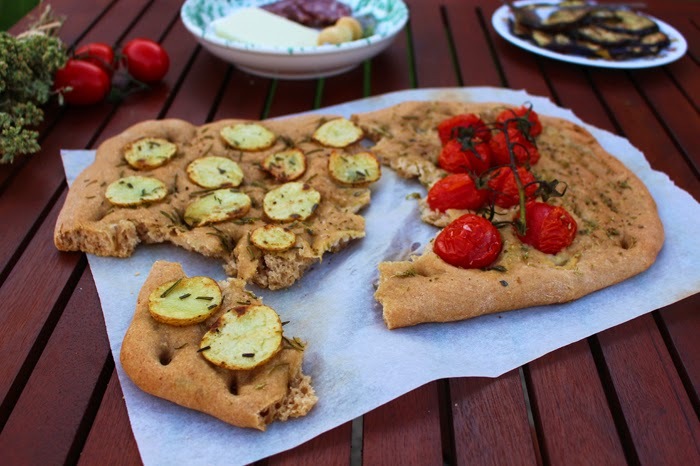 With a bit of extra time up my sleeve to make and rest the dough, this simple and ever-so friendly Spelt Focaccia two-ways was the perfect dinner for two, with a few little extra morsels on the side. 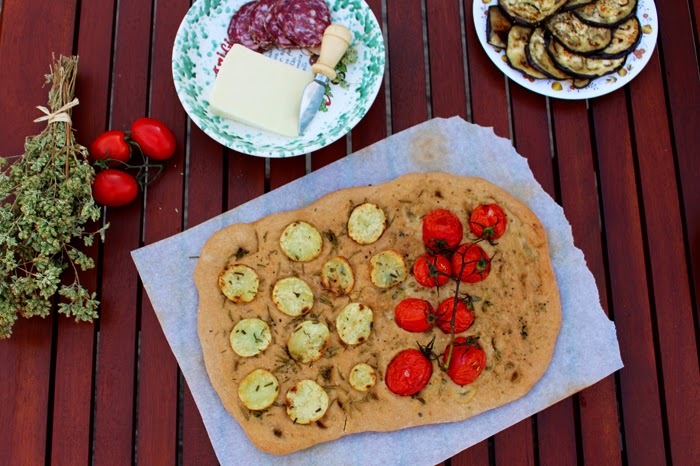 Note: For those occasions when I don’t have as much time, I get delicious woodfired spelt pizza from Pizza Farro in Northcote or Trotters in Carlton, both solely use spelt flour to make their pizza – and I bet no one would ever know the difference! Pizza Farro also do an amazing gluten free pizza. Place yeast, sugar and salt into a mug with the lukewarm water. Stir gently and set aside for 10 minutes until foamy. Place 2 cups of flour in a large bowl, and set aside another half cup of flour close by. Gradually pour the yeast mixture into the flour and begin mixing with your hand. The dough will be very sticky to begin with, so continue to knead and add the additional 1/2 cup of flour as needed til you form a smooth (still slightly sticky) dough. Cover the bowl with glad wrap followed by a blanket. Leave the dough to rise for 1-2 hours, by a window or somewhere warm. The dough should now have risen 2 or 3 times its size. With a dusting of flour carefully pull the dough into a ball on a floured surface. No kneading is required, but now is the time to divide the dough into the portions you’d like. Flatten each portion evenly with your hands into a well-oiled tray. Preheat oven to 220°C and rest the dough in the tray for another 30 minutes someplace warm while you prepare the toppings. Wash and thinly slice potato in circles, and roughly chop rosemary leaves. Fry potatoes with a drizzle of oil, sprinkle of salt and half of the rosemary. Wash the truss of tomatoes and have the oregano at the ready. 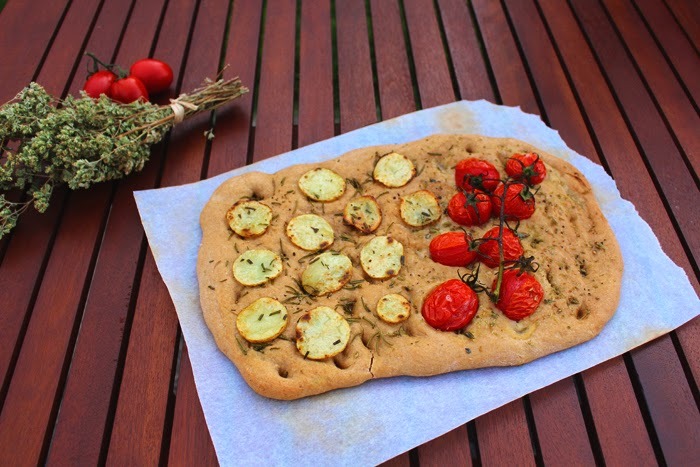 Drizzle olive oil over the whole foccacia, and cover half with rosemary and half with oregano. Lightly massage the oil into the herbs with your hands, spread potatoes over the rosemary half and lay tomatoes over the oregano. Finish with a generous sprinkle of salt, and more olive oil if needed. Place in the oven and bake for 20 minutes or until golden.